We enjoyed this creamy smooth soup on a cold winter’s day. It has a lovely sweet mild flavor and is full of vitamins. Wash, de-seed and cut up the pumpkin or squash. Put the pumpkin pieces in and sauté for 5 minutes, stirring to evenly coat the pumpkin. Add the vegetable bouillon and cook on a medium heat until the pumpkin is soft. While the pumpkin is cooking, lightly toast the walnuts in a dry frying pan. Allow the walnuts to cool, then lightly grind. Peel and slice the mango and cut in chunks. Add the mango pieces to the soup. Season with cayenne, cinnamon, salt and pepper to taste. 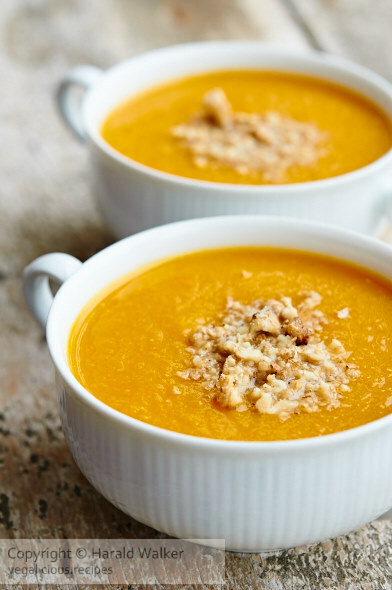 Serve the soup garnished with the ground-chopped walnuts and a few dashes of nutmeg. 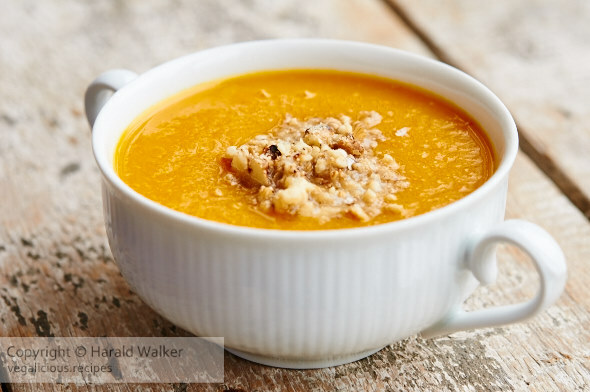 Posted by Chris Walker on February 5, 2013 in Mango, Pumpkin, Soups, Squash, Walnut.